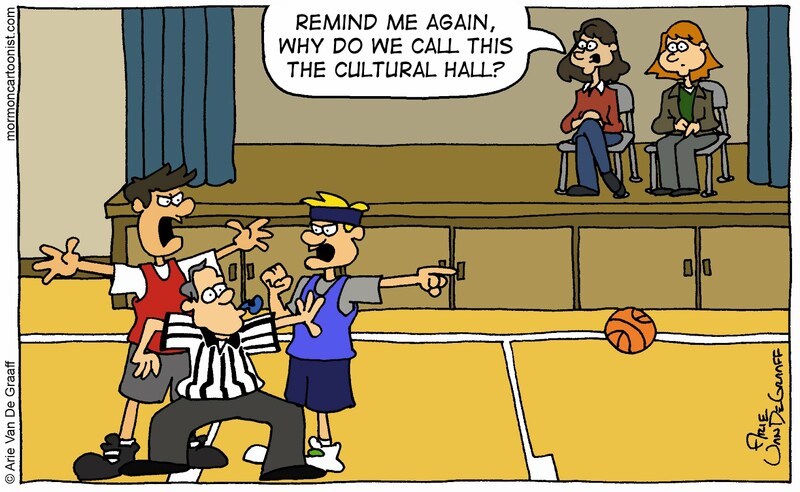 After being convinced by fellow Mormon Cartoonist Kevin Beckstrom that BYU's basketball team will never make a Final Four, I have no desire to comment on today's March Madness gag. Instead, I'll write about General Conference. This year I want to make you aware of three General Conference resources. First, the LDS Coloring Book app continues to be a great way to keep children quietly engaged. The app has ten coloring books to choose from, including a General Conference themed one introduced just in time for this weekend. It might be a stretch to call the LDS Laughs app a General Conference resource (in fact, it might be sacrilege to do so), but I'm just so proud of it that I wanted to mention it here. If you haven't downloaded this free app off of the iTunes store yet, please do so. And finally, for any of you who might not have enough iPhones and iPads to distribute to all of your children or for any of you who (shudder) don't have any at all, you're welcome to print off my General Conference Activity Packet. You can find this 9-page packet at both Sugar Doodle and LDS Clipart. For the record, I didn't say "never," just that history isn't on their side. If the NCAA would move the Final Four games to start right after Priesthood Session ends and conclude before Music and the Spoken Word on Sunday morning, we could finally have a winner. However, I will bear a second witness that the conference activity sheets are great, and no iThingy should be without the cartoon app!